Jason Reitman’s initial four features each contained a distinctly cynical edge, mainly due to their bitter, cantankerous anti-heroes who had witticisms to spare. “Labor Day,” his fifth and most fluid work, contains no such ironic refrains. A significant departure for the director, “Labor Day” is a classical, melodramatic tearjerker that’s also a sincere coming-of-age story. Reitman’s imprint is essentially invisbile, perhaps because he stuck so closely to the source material. Described by the director at the movie’s Telluride premiere as “the truest adaptation I will ever write,” the result indeed feels as if it hails from a different author, in this case Joyce Maynard, whose 2009 novel provides the basis for Reitman’s script. 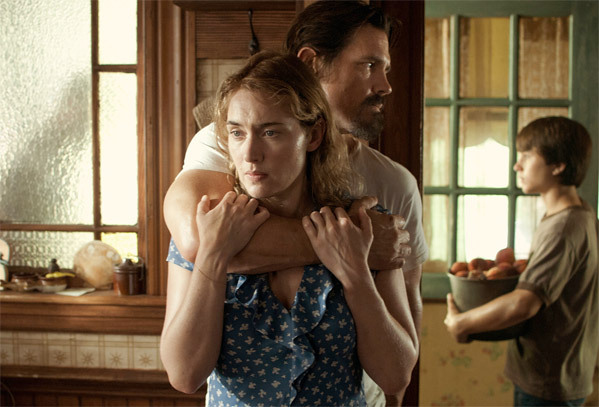 Because it adheres to a noticeably restrained literary style, “Labor Day” at times feels almost too muted for its rather bizarre subject matter, which finds an escaped convict falling in love with a woman he takes hostage and becoming a surrogate father for her son. But Reitman largely cedes control to a tightly wound cast and lets the somber tone find its way. In its opening scenes, “Labor Day” establishes a mopey scenario set in a vague New Hampshire town in 1987, when adolescent Henry Wheeler (Gattlin Griffith) lives a solemn existence with his downbeat single mother Adele (Kate Winslet), who has remained in a deep funk ever since her divorce to Henry’s father (Clark Gregg). Narrated by the adult Henry (Tobey Maguire) as he looks back on this melancholic time, “Labor Day” efficiently lays out Henry’s commitment to sticking by his fragile mother’s side — a commitment that gets complicated with the sudden arrival of Frank (Josh Brolin), a convicted murderer on the lam bleeding at the waist who corners the couple in a grocery store and forces them to take him home. At first sternly insisting he hide out for a few hours while the cops finish their search, Frank turns out to be more complicated than your average fugitive, and quickly gains the trust of his captors when he teaches them how to bake a pie in the kitchen. As Frank’s role in the household continues to evolve, the movie’s tone moves with him. Similar in nature to Jeff Nichols’ expressionistic coming-of-age saga “Mud,” which also involved a gentle-hearted escapee, “Labor Day” uses the crime backdrop to unfurl a far more sophisticated drama about the sense of danger associated with unlocking repressed emotions. Yet even as Frank has symbolic quality, developing a gentle relationship with Adele that gradually allows her to come out of her shell, it’s his literal value as the concerned father Henry never had that gradually injects “Labor Day” with legitimate pathos, particularly because it’s so obvious that the tidy setup can’t last forever. Photographed with heavy shadows and soft hues by Eric Steelberg, the movie maintains a noticeably frayed look that lends a much older feel to the proceedings, as if the entire plot emanates from Henry’s memory banks. However, the story remains so traditionally structured that it rarely drifts, save for an underwritten romance that Henry experiences with a classmate. In those scenes and a few others, Reitman treats the material with an earnestness that occasionally slows things down; the movie largely works whenever it keeps barreling ahead, as the entire narrative takes place over the course of the titular holiday weekend. In its closing act, “Labor Day” arrives at a fulfilling series of confrontations that nicely balance off the tenderness of its introductory scenes. Even so, “Labor Day” manages to avoid grand gestures to a large degree because of its cast. Both Winslet and Brolin initially come across as noticeably stilted, but with time their restraint speaks volumes about the sadness haunting both characters. Winslet delivers a compellingly subtle riff on domestic frustrations by conveying volumes of her hardships with her eyes alone. Brolin has played tough guys before, but here he pulls off the tricky maneuver of turning a cliché into a strangely likable mystery man whose own back story — revealed in a series of oblique flashbacks — turns his initial air of cruelly on its ear. Griffith, a genuine discovery, ably conveys a mindset awkwardly stuck between personal desires and mature thought process. At one point, Frank insists on tying up Adele and Henry so they don’t get implicated if he’s eventually captured. “It’s about keeping up appearances,” he says, in one of the few cases where “Labor Day” acknowledges the multiple layers of storytelling at work. While Henry goes through a process of understanding his mother’s grief through the unusual circumstances they find themselves in, Reitman also gives into the romantic nature of the material, particularly in its swooning conclusion. There’s a certain elegant simplicity to the movie’s execution that maintains a spirit of familiarity but also keeps the material afloat. It’s enough of a success to prove that Reitman, like his protagonists in “Labor Day,” has the ability to move beyond his roots and try something different. HOW WILL IT PLAY? Paramount releases “Labor Day” in late December, right in the heat of awards season, and its low key nature during the crowded time may hinder its long-term potential. But the combination of strong word of mouth and performances should help the movie perform solidly during its initial run through the end of the year.